Imagine for a moment the year is 2000 B.C. and you’re a fisherman living along the coast of what is now Southern Europe. Like any other morning, you’re fishing when suddenly a powerful burst of energy enters your body. It creates a tingling sensation in your fingertips, a flutter in your heart and warmth in your belly. You know it’s not anxiety or a heart attack because it feels comforting and fulfilling. The Earth is not flat. The Earth is a sphere. You can visualize it revolving around the sun in a predictable orbital pattern. These visualizations also reveal that the Earth is part of a solar system of eight planets separate from other stars in the night’s sky and that these other stars follow similar predictable patterns of movement. There is a whole uncharted universe out there that nobody else is aware of. Once the magnitude of your epiphany settles in your mind, you begin to sweat from nervousness. Because while the small seaside village you live in is peaceful, there is little tolerance for outlandish ideas and theories like the ones that just rattled your brain. If you were to tell others about them, the nobles and town leaders might interpret it as a direct threat to the cultural stability of the community, and the rest of the villagers would likely think you’re crazy. You could be exiled! You decide that you must handle your business as usual and leave the deep visions and epiphanies to the witch doctors and nomads who dwell in the forests on the outskirts of civilization. These people have already decided that the world they grew up in doesn’t hold the answers they are looking for. They are the ones who should convey these outlandish ideas to the world. Because they have nothing to lose. At least not as much as you do. So, you don’t tell a soul about your epiphany. Days roll into weeks. Weeks roll into months. And you imagine, each day, that you are better off for having kept it a secret. But you are also aware that keeping this secret is eating away at you from the inside out. You have distanced yourself from people and have been sleeping less and less. Your mind won’t stop stirring. One night, after hours of stirring, you finally fall asleep and begin to dream. You dream you’re sitting at round table in a dimly lit room. There is a woman sitting across the table from you. You can barely make out her face, but you can see her hair is silver and her skin is worn. She seems old and wise. And it feels like she can see right through to your soul. But you also feel comforted because there is nothing to hide from her. She already knows what you know. “Do you know why you’re sitting here with me?” she asks in a low, soothing voice. You sit in silence with her for a moment. Just staring into her eyes. You feel an energy emanating from her heart and gently soothing yours. Easing it of tension. Letting it know that it can beat loudly and proudly at any pace it wants to without concern. Because it’s safe here—a sanctuary devoid of judgment. And all of the fear inside you slowly subsides. Her words of wisdom are so clear, so simple. But the real world, you recall, is far more twisted and convoluted. In the real world, there are cultures and customs that have been around for generations that must be dealt with. Your eyes slowly open. You sit up in bed and silently meditate over your dream. After a few moments, you stand up and walk out the front door of your cabin to get some fresh air. And as you stand there watching the sun rise over the village, you notice something is different. The entire village seems brighter and more alive than you remember. Has the village changed? Have the people changed? Or is it just you? You aren’t sure. What you are sure of is that you have fish to catch today. And that you have something important to say. And while you don’t know yet how you will say it, you are gradually growing more and more confident that you will know soon. And by the time you realize you know, you will have already begun to say what you need to say. And the world around you will have already begun to change. Sometimes we all need to be reminded of how our silence and inaction can become self-abuse. You have to admit, to a certain extent, you have spent too much of your life tiptoeing around. Trying to become quieter. Smaller. Less sensitive and intuitive. Less “crazy.” Less YOU. Because you didn’t want to overwhelm people. You wanted to make a good impression with them. You wanted to fit in. You wanted everyone to like you. You wanted everything to be easy. So, for too much of your life, you’ve sacrificed a part of yourself—a part of the truth—for the sake of not stepping out of line. And for too much of your life, you’ve hurt yourself with your own silence and inaction. But you’re tired of living this way, right? Let’s make a change today, together. I’d love to know what you think of this short essay. What’s on your mind right now? Hi Angel and Marc. I remember you two sharing a similar story at your Think Better Live Better seminar a couple years ago when I attended. Thank you for the refreshing reminder. I was just reflecting on the past few months of my life this morning and how I made a decision to take a young man working for me into therapy even though in doing so I would reveal to him and others who worked for me that I also go to therapy regularly. For a long time I hid my therapy appointments because I felt ashamed, but after taking the young man and helping him I realized that not only had I done the right thing for him but a tremendous burden had been lifted from me as well. Truly, what a great story and reminder! May we all be inspired to take action and not be afraid to go against the grain. What a beautiful essay. The world does not understand that yes, we all have differences but we are traveling on this journey together. Share what you know or at least what you feel is true. In one way or another at some point everyone will need someone to hear them out. You cant totally travel on this journey alone. I’m learning to express my feelings—my truths—because who knows, my thoughts could someday help another just like yours did for me today. Thanks for sending out the email that linked to this article this morning. I needed it. Truly nice work! Honestly, this article is why I always read your blog. You deliver simple, important lessons in the most unique and relatable format I have seen. This is a great story and I look forward to sharing it with my daughter. I am reading this post at a time when I’m painfully trying to figure out how to leave what I know behind and press towards what’s calling me. Fear, judgement, insecurity and so many other feeling are clouding my mind. Can I really walk away? Can I really be successful doing something else? I will only know when I make the change. Thank you for your posts, I am a quiet follower for years. Thanks for sharing this story. I have found that over the past twelve months I have made some changes to my life, and I feel more at peace and accepted for who I am. I changed my job, which has enabled me to grow immensely. I have also managed to stand up to some toxic family members at a time when they should have been caring and compassionate. I now feel free, as I know that they can no longer influence any part of my life. Do you give her encouragement in what she is trying to do?? Are you interested in her and give her confidence? Maybe she feels alone and stuck, too. Did you ask her?? What is she getting out of your new awaken self?? Have always been just concerned about yourself?? I love this. It was what I needed today. What the two of you, Marc and Angel, bring to the world is so valuable. You have taken your vulnerability and created power. Power that others can incorporate into their lives for positive change. I often think – when I am at the end of my life – who did I positively influence? For the two of you the answer will be immeasurable. Very grateful. Loved TBLB 2018! Hi Marc and Angel, this is a very thought-provoking post. I’ve definitely felt society’s pressure transform myself in a way that doesn’t allow me to express my true self. I’m still on the way to discovering the exact strategy I need to implement in order to escape from how the system has packaged us with the conveyor belt style life where we go to school, get a job, retire and then die. Maybe sometimes we just need to be courageous and say “screw it”? Thanks for this beautiful story. I love how you’ve been opening your posts with stories that read like fairy tales — and always make a relevant point. Today’s story hit home in a very different way. In the past couple of years, due to deep division and political anger on social media, I found I’ve been distancing myself from certain friends and neighbors who make me feel judged or less-than because I don’t agree with their politics. I am a peacemaker who’s always been active in social justice causes — so this has been so difficult for me. Sadly, like the fisherman in your story, I’ve retreated into my own world and kept very quiet so as not to create any more drama or lose any more friends. I’ve been afraid to stand up for myself — but your essay today is making me think twice. Thanks so much. Dear Marc and Angel, I follow you from the other side of the Atlantic. Just two days ago I saw A Star is Born which had a similar message: Say what you need to say, don’t apologize for it. If people are ready to hear it, wonderful. If not, it is ok. I had written a blog post about it for my English language students (a blog I just started) including what I felt I needed to say, but I have not dared to post it yet. I sent it to a dear friend of mine, asking her feedback and saying I needed some courage to post … And then I read this blog post of yours. I know the Universe is talking to me. Allowing me to take the time to build up that courage. Thank you for not being afraid to say what you need to say. It is truly remarkable that the messages and stories that you send nearly always synch and help with a particular problem or issue I face. Today’s story really resonated as well and today I must thank you so very much for your messages. They’ve helped me stand up for myself and have faith in my strengths. I am a successful professsional woman, however, I have been belittled and abused by narcissists. I’ve broken the cycle of abuse and am having a truly wonderful life. I have reclaimed my strength of spirit, integrity, and self confidence so that now I can speak the truth, my truth, and be authentic. I am rewarded with loving, wonderful relationships with friends and family. 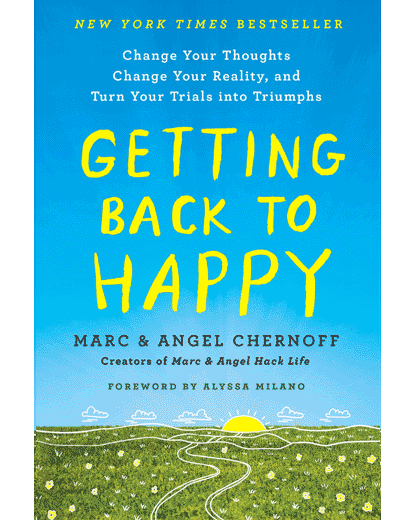 Thank you, Marc and Angel, for helping me so profoundly. It is truly remarkable that the messages and stories that you send nearly always synch and help with a particular problem or issue I face. Today’s story really resonated as well and today I must thank you so very much for your messages. They’ve helped me stand up for myself and have faith in my strengths. I am a successful professsional woman, however, I have been belittled and abused by narcissists through my life. I’m highly intelligent and look just fine but wanted to crumble inside. It’s as though I have gone through life what was on the outside didn’t match my inside. I’ve broken the cycle of abuse and am having a truly wonderful life. I have reclaimed my strength of spirit, integrity, and self confidence so that now I can speak the truth, my truth, and be authentic. I am rewarded with loving, wonderful relationships with friends and family. Thank you, Marc and Angel, for helping me so profoundly. I agree with the premise of this story because I have come to the point of understanding that I reflect/express the one divine Love that is here to bless myself and others with a truth that sustains and maintains wisdom, honesty, compassion, courage, strength, consistency, health and happiness. Your blog agrees with what I’ve come to know and live. This story has been on its way to me for quite a long time. This is the day I will begin the path I’ve avoided for too long. It’s time for me to speak my truth and by doing that I will become who I am and will help others too. Thank you. I appreciated reading this today. I love what you write and this resonates with me. I believe I have lived most of my life in silence and now speaking out and trying to live my authentic life has given me a new lease in life. Thank you Angel. I have been down in the dumps for a few days. And reading “it may feel like you are at the mercy of the world, you are not. Because the world around you is merely a reflection of what’s inside you—your thoughts” was a powerful reminder. I have noticed so many times that the answers I am looking for are there – always. But at times, someone nudges me to see them. Today it was your post. So thank you from the bottom of my heart for uplifting me. 1. I had brunch with two very close friends yesterday and the message they were giving me was that I know what to do next. That do I really need to keep mining or over thinking it and can’t I just act. 3. I listened to Matt Kahn’s video on Spiritual Journey – The End of Inner Conflict last night and it was entirely focused on the notion that it’s my body that is on the journey, that my body needs to process things to heal. My inner consciousness is learning to allow the body to heal on it’s own terms and conditions. I just need to hold space for the body and honor when it’s completed it’s healing process and is ready to move to the next level. 3. I woke this morning came downstairs began to make coffee and recognized a shift, a physical shift, in my body. It’s like my body had completed processing something, was healed, and now was telling me it’s good to move forward, and that feeling was very strong very overt and real. 4. I made my coffee, sat down and opened up my laptop and this story, “Make a Change Today” was sitting there which I just finished reading and it was reinforcing the same message as the other 4 points I noted above. It’s clear to me that “I now know that I am ready” and that I need to take action and keep moving forward. Too many separate things these past 24 hours have given me the same indications. I’ve become a huge believer in learning to listen to my body, my physical being, and I’m learning to honor my body’s processes. There is no such thing as coincidence. Everything happens for a reason. Thank you Marc & Angel for sharing this story today, for me it was the final piece of the universe telling me to, “Keep moving forward” and the time to move is today/now. Thank you for another message personalized somehow to each of us. For me, this message is a challenge to express the truth that has been dawning on me that the man I am currently dating is truly a misogynist. He has so many other good qualities that I have not been willing to acknowledge this fact of his personality. And I should know – my father was a woman-hater and that it what I tend to attract into my life. I keep thinking that I have overcome this tendency, but here it is again. Will I have the courage to discuss this with Charles or will I keep this to myself, allowing the denigrating behavior to continue without giving him or myself the opportunity to reach for something higher and better and healing? My epiphany came a few weeks ago and I tentatively raised the issue with a few brief, non-specific sentences with him, but not in a way that would bring the issue into full light and allow us to examine it together. Thank you. This is one of many instances where your article has had direct impact on my life. I have been in a silent tour my thoughts (problems) lately, and I haven’t spoken up. Thank you for this perspective. What resonated with me was, every one of us has something inside that tells us to share it, but we internalize it and it eats away at the ability to enjoy life until we do. I am a hypersensitive, emotional person and I am always feeling hurt by even small words that resemble the pain I endured from my past. This sort of puts me in the place of being in-between the rock and a hard place. If I tell someone and they realize it hurts me, hopefully they won’t do it again. If I don’t tell them, they will just continue to be themselves as they are and hurt me several times, I’m sure, in my relationship with them throughout life. The down side, is when I tell them and they change, I feel as if I forced their hand to not be that way. I’m always thinking about their feelings over mine and I do this with everyone. How do you share what you know is either right or wrong, without causing other people to also change who they are? That’s where talking to someone who doesn’t know you comes into play. They are unbiased to you or the one you need to share with. For me, the right thing to do is just share what’s on my mind before it hurts me in however it will. If people around you don’t understand or refuse to accept you then maybe those people aren’t the right people to have in your life. As we know, diversity can be a wonderful or damaging thing. It can bring people together to learn or divide them. The resignation is being true to who you are. If you end up being wrong, be strong enough to accept it. And if you were right, share it even more. I think too deeply and need to pick apart every feeling anything may give off, and maybe that’s a downfall to some, but to some, they appreciate it that I can think beyond the big picture. Thank you guys for always coming through with a great blog post that makes me think. And thanks for letting us all share. This is by far my favorite one- it was beautiful and spoke to me- I felt like I was actually on the beach with my hands in the water. I have been reading these daily since my husband left me 7 months ago. The demise and finality of my marriage was devastating to me. I will also be brutally honest and take my part in wrecking our marriage as much as he did and I don’t think either one of us realized it. We had some major setbacks in 2017 and I’ve recently found out out he is dating a former friend . It was a double betrayal so I was super angry at the beginning and am trying to be more calm. I have found unbelievable strength in your daily e-mails and look forward to them. I do realize from your posts and people that you have written about I am not alone. I do know other people have it far worse- like a friend of mine who has been fighting a rare form of cancer for almost 3 years now. I was talking about this to her and told her we should talk about her instead as her struggle was far greater than mine. What she said still resonates with me – “pain is pain”, and I think this is what you’re always reiterating in your posts- so no matter what anyone is going through- you can try to get back to happy . I never thought I would feel good again, and I still don’t feel ‘good’ but I have some hope now that I’m turning a corner. Please know your posts have helped me get through my darkest days- – and have spoken to me like you were here with me, trying to combat my daily struggles. Thank you. Thank you for this beautiful story. It is such an important reminder to be aware of our truth and to say what needs to be said, but to trust that we will be gently guided and will know when we need to speak/act. Wow that essay brought me to tears because I know that feeling of holding back to keep people comfortable not saying what I feel in fear of hurting or upsetting someone else. I can feel the pieces of my soul that were torn the moments when I stopped being “Me” not the me anyone else knew but the “Me” I knew. It’s hard but I’m tired of living bya! standards that aren’t my own that I know should an could be better. I don’t know how or where to start so I need to listen to myself an trust in myself because yes it’s an essay but the truth can always be an will always be seen as truth and I needed that dose because letting go of the fear is hard but dying inside scared me more. This reminded me of a quote I recently read, that said ideas considered “normal” today were once considered scary, bizarre and outlandish, and it’s up to us to bravely bring them forward. I found the story comforting and soothing. I wish I had that clear of a relationship with the universal wisdom the fisherman connected with. So much of what I do /we do is based on gut, on faith, following our own light, and tamping down the insecurity of believing in those ideas. Wow!! This story is a confirmation of what God has revealed to me on friday the 13/10/2018 @ around 21:30. Few things mentioned in this story are exactly the things that l’ve experienced when the spirit of God was upon me. God told me to start writing a book about my life experiences and l must use the scriptures of the bible as part of my references. I could not believe what God was telling me as l didn’t even know what l was going to write about. To my shock, God provided me with the name of the book, whilst l was still in shock and unware of what would be the next thing to write on this book. God said to me use the last post you posted on Facebook. Use the headings on your post and you will know exactly what next to write as soon as you put your headings on document. I started writing as instructed. Good news is, my book is half way from being finished. Hopefully it will be out not later than the end of this year. Thanks to you Marc & Angel, l admire the gift God has given you. You’ve helped my inner person for so many years. Finally l found myself including the person l was designed to be. Its all because of reading your emails even when l didn’t feel like. There would always be this little voice whispering in my ears that says “you must make time to read Marc & Angels quotes, its for your own good” Today l’m confident enough to write publicly because of your quotes. They moved my heart in a manner that cannot be expressed enough. My perception of life is completely different than of the people of this world. I presume your quotes have everything to do with the changes in my life. Your quotes are always encouraging us to start doing things today and not any other day. I will forever be grateful to have known you. God’s willing l want to meet you in person before l leave this world so l can properly thank you for your contribution in making my life better. I am what l am today because of you!! This made me realize that I need to listen to my inner wisdom and LIVE BIG and BE ME…….and share my gifts……for that is the secret to living an authentic life!! I too have always been a tiptoer. Thank you for your inspirational message that it is okay to change now. I loved reading this. I have been buried within a cocoon of inertia for the longest time and I have no idea of how to become unstuck. I’m in long tern therapy and there have been some changes along the way but my inability to actually feel part of my world actually left me feeling that my life is pointless and not worth living. I’m going through the motions. But your essay is about perspective, I guess. I know that if I can change MY perspective inwardly, then things start to seem different outwardly. Thank you for posting this. Just before I read this very moving story I had been thinking about how so many of us hide our intelligence. I had been working out how I was going to share this with a friend who I know is struggling. We need to find opportunities to talk about it when we need to when there is learning to do. So thank you. This was helpful. Reading this just made me cry, because my life is the complete opposite of where you and people like you are in your lives. I’m alone without friends, because I withdrew from life and from people a long time ago. I work as a receptionist, because I’m not college educated. I’ve never owned a home, nor can I even afford to rent an apartment, because living in Northern California has become much too costly. I have never been married, and haven’t been in a romantic relationship since I don’t know when. I definitely need someone to talk to, but therapy is too costly. I have family, my mom and 4 siblings, but we’re not close the way we used to be. I feel like I wouldn’t even know where to begin, when I consider making improvements to my self and my life. There’s just too much wrong with me. Such a beautiful story and undoubtedly an eye opener. This will not be forgotten. This is something which has left a mark in our brains and hearts and it seems that there is no better way to explain this very thing to people. Hats off !!! A great job too ! !